Ripe Blackberries are lacking in pectin and you would have problems getting a good set without the apples. You can also add some lemon juice to taste as they are also lacking in acid. Makes approximately 6 lbs (2.7 kg) of blackberry and apple jam. set. Had a litle taste quite sweet but lovely. 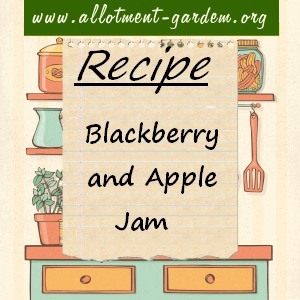 I made this jam last year using blackberries from my partners garden, and the windfalls from my neighbours tree. 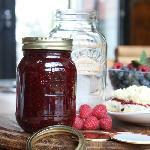 The resulting jam was by far the best preserve I’d made that year! I’m so glad I followed your recipe. What sort of apples are best, cookers or eaters? Cooking or crab apples as they contain more pectin. 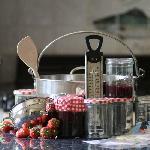 Is there a rule about how much water to use in Jam making? 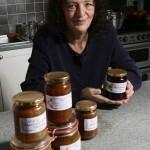 My Auntie who taught me how to make jam ,used to have 4 lbs each of fruit and sugar, and get 8 lbs Jam. I don’t seem to get as much. I am wondering if I don’t use enough water. There’s no rule, it depends on the fruit that you are using. With the berry fruits you just need enough to prevent it sticking on the pan base. For 4 lb sugar and 4 lb fruit you should get between 6 and 7 lbs. I used eating apples (not quite ripe ones) and although I thought it might not set and it seemed to take longer to thicken, it worked and the jam set beautifully…..and it was my first try at making jam, fantasic recipe, thanks. Val – I have loads of elderberries – can these be used instead of blackberries? I used wild blackberries and windfall apples, so a very cheap jam to make. The jam is absolutely delicious, I have to limit how much I eat. More blackberries in the freezer, so I will deinitely be making another batch, probably sooner than I think! How long will this jam last? My Hubby says you are supposed to soak the berries in luke warm water and salt to draw out the worms…What do you think? Never made jam before and thought I’d give it a go. Do you need to use jam sugar for this recipe or is white sugar good enough? Ordinary white sugar should be fine as you’re adding the pectin required for a good set to the blackberry with the use of apple. I’e alot of home grown but been frozen blackberries. Will they be just as good to use and if so do i follow the same recipe. Yes they’ll be fine for jam. Allow an extra 10% of blackberries to the recipe to allow for loss of pectin during freezing. Yes that works, I was told it by my Mum and always do it with blackberries. Just cover with water containing a sprinkling of salt and leave for a few minutes, not much longer than that and you can seem the worms coming to the surface. I usually check the berries over as well to see if any are still attached. I have a lot of eating apples, which have grown in my garden. Are my (first) attempts at making mint and cinnamon jelly with them likely to be a success seeing as they are not crab or cooking apples? The apples have grown quite small this year and are just sweet enough to eat. They may not contain enough pectin but you could get round this by using jam sugar or adding pectin stock. Made this twice this year so far from hedgerow fruit and both times it has turned out fantastic, and very easy to make. Made this yesterday, with Blackberries from the hedgerow and a bag of windfall apples from a neighbour. Another success thanks for the great simple recipe, will have to go and pick more Blackberries! I made this today but didn’t get the worms out with salt, I guess they will just add a bit of protein at worst as the heat will kill them right? I already tasted the jam on toast and it sure is good! Lovely jam, simple to do.